If you choose wisely, you can get either an Audi Q5 or A5 sedan with the same drivetrain. Maybe we can all get along, after all — that is, those who demand to buy, own, drive, and put fuel in an SUV, and those who resist the SUV trend and think we should all be driving cars. Audi is in the position of many car-makers these days, and doesn’t particularly care which you choose, because it provides several excellent examples of both from which consumers can choose. The remarkable thing about Audi is they can reach any reasonable compromise, with midsize vehicles such as the A5 Sportback 2.0T sedan, and the Q5 2.0T midsize SUV, which might provide the best example of how you can pick either one, and not possibly miss. Coupe-like sleekness is the calling card of the midsize A5 Sportback. 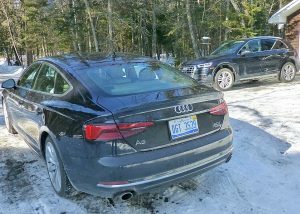 While the A5 Sportback has its wonderfully sleek lines — better, I think, than the longer Sportback version of the longer, costlier and more exotic Audi A7 sedan — the Q5 is a very neat size that drops in between the larger Q7 and the compact Q3, and has a unique look of its own. The worldwide trend of the last few years has been to try to meet new and exacting emission and economy standards by reducing engine size without eliminating driving satisfaction, and the answer has been to use turbocharged 4-cylinder engines where V6 or even V8 power-plants formerly resided. It’s a technique that everybody is trying to perfect, and the advantage Audi has is that it, and parent Volkswagen, have for years been using and perfecting a 2.0-liter 4-cylinder, turbocharged engine to give V6-type power with far better fuel efficiency. For example, take the latest 2.0-liter Audi 4 with direct injection, and turbocharging. You can tweak it through the computer up to 252 horsepower and 273 foot-pounds of torque. That is sufficient to move the A5 Sportback to its more-agile best, through Audi’s traditional quattro all-wheel -drive system, regulated by a 7-speed S-tronic automatic transmission that is not only smooth shifting, but can be manually overridden by steering-wheel-mounted paddles. Graceful arching back of Q5 provides room and utility to serve as family SUV. And, get this: That exact powertrain can be placed on a stiff, rigid platform, and then you could set a sleek, artfully crafted A5 Sportback body on it, or you could set a neatly contoured midsize Q5 SUV body on it. In this case, both vehicles have the 2.0 turbo 4, with the same 7-speed transmission, the same quattro AWD system, and with even the same horsepower and torque figures. For those wondering how to afford one over the other, the sticker prices also are very similar. The A5 Sportback with the Prestige package goes up from a base price of $42,600 to a sticker of $55,400. The Q5 with the Prestige package starts at $41,500 and lists as equipped for $56,100. What is further intriguing is that the A5 Sportback has final assembly at the home plant in Ingolstadt, Germany, and the Q5 has final assembly in Audi’s new plant in San Jose Chiapa, Mexico. The 2.0 engine in the A5 lists Audi’s new plant in Hungary as its coountry of origin; the Q5’s 2.0 says Mexico. The common transmissions were built in Germany. The amazing coincidence was that both vehicles looked black, if it was dark or cloudy, and betrayed a definite off-black hue in bright light. Getting up close and scrutinizing closely, I realized both were definitely loaded with metallic highlights, and the actual color, he A5 Sportback stat sheet said: “Moonlight Blue Metallic,” and when I checked the Q5 sheet, it said: “Midnight Blue Metallic.” Hah! No wonder they looked similar. In both cases, you had to add $575 to the price to get that unique color. Rakish slope of A5 Sportback combines sportiness with sedan/hatch utility. I have a personal thing with sedans that have a fastback roofline. If it doesn’t take up so much headroom that you can only carry small children, or those adults with removable heads, back there, then the style carries the day. Mercedes built one, so did Volkswagen, and BMW, and some of the Asian and U.S. manufacturers have also tried their hand at it. But Audi pretty much pefected it with the larger A7 luxury sedan, but I think adding the Sportback’s sporty flair to the midsize sedan is a definite winner. But with both vehicles and only a week, I had to deploy my wife, Joan, to help out. 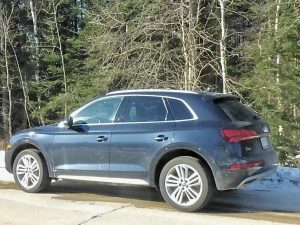 In her job, she had to do a hundred miles of driving after a nasty snowstorm, so I suggested she should try out the Q5, for the safety, security, and comfort of a substantially sized SUV. She jumped at the opportunty, and that gave me the sly chance to drive the extremely sleek A5 Sportback. 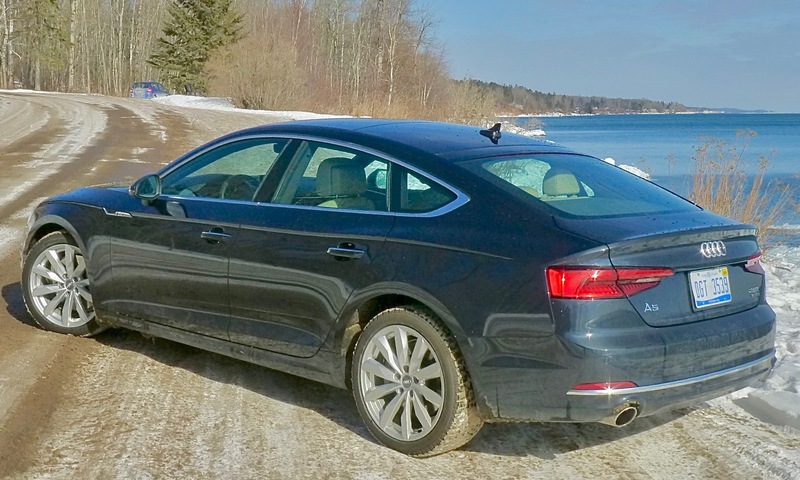 It knifed through every challenge of slippery roadways and steep hillsides, and every time I parked someplace, and walked across the street, I would pause to look back and admire the great lines of the A5, with its sloped hatch Sportback. It also, by the way, was comfortable in the rear seat, and had plenty of room in the trunk. But driving was the best, with exhilarating punch whenever you hit the gas, and the fun of up- or downshifting with the paddles amplified the enjoyment. I also was able to register 32 miles per gallon in overall driving, which was impressive because of the time of year and foul weather, and steep-hill city driving. The EPA estimates 24 city, 34 highway, and I had no trouble reaching the maximum on a sustained freeway trip to Minneapolis and back. 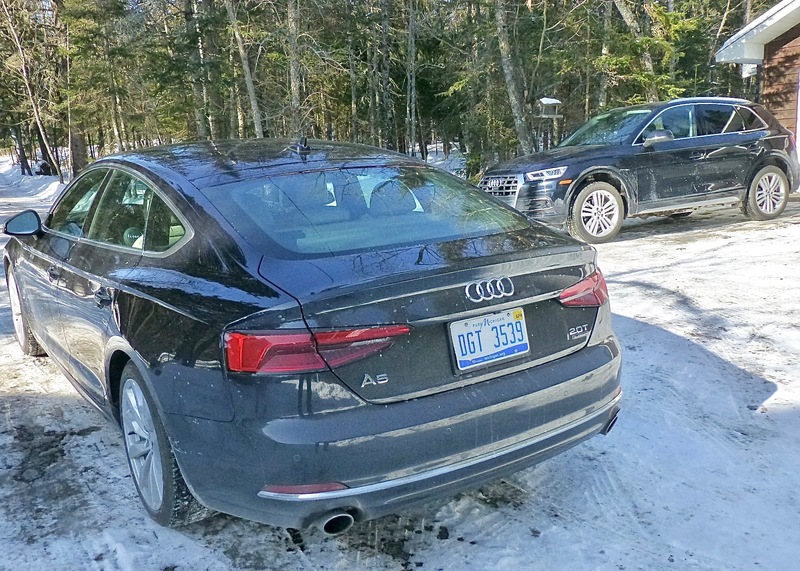 What was interesting is that when Joan and I returned home after that first day, before I could rave about how exceptional the A5 Sportback was, she positively gushed about how the Q5 might be the finest vehicle she had ever driven on winter highways. We swapped vehicles throughout the week, and I had to agree with her about how outstanding the Q5 was, with fuel economy of about 26 comibined from 23 city, 27 highway estimates, with its highly maneuverable size and agility, and she had to temper her praise for the Q5 after spending most of a day or two in the A5 Sportback. Larger roof of Q5 provided for huge panoramic sunroof for all occupants to enjoy. Both cars have firmly supportive seats, and in both vehicles we were treated to the remarkable and adjustable navigation system, which can go from a flat map, to 3-dimensional, to a Google map scene that actually comes from satellites and shows you actual picture renditions of wherever you are. I have gone on about this system in the past, but I couldn’t help but park in my own rural driveway and zoom in the Google thing, which showed a precise view of our house, and across the car turnaround, our long and large garage. On top of that, you can have that view on the large nav screen, and you also can adjust your instrument panel several different ways, showing whatever information you choose between the large, round tachometer and speedometer, or you can click it another way and summon the map to stand between them. Then you click it again, and reduce the size of the spedometer and tack, and show a panoramic map that runs from left to right across the whole display, with the ncessary instruments superimposed. That way, you can use the nav screen for all sorts of difference controls, including tuning for the superb Bang and Olufsen audio system. 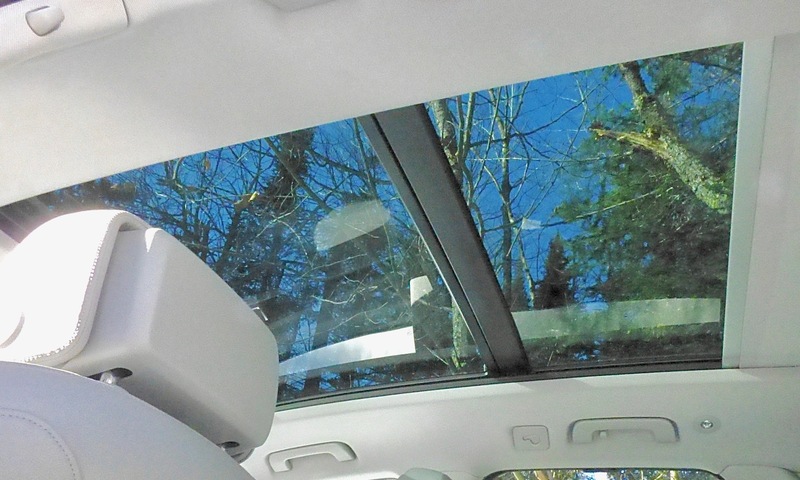 The A5 Sportback had a nice sunroof, but the Q5 had a huge, panoramic sunroof that gave light to both front and rear seats. Both also had top-view surround visibility on the big screen, and head-up display for the driver. LED headlights with extremely sharp cutoff, and all the safety and security items you could load into vehicles. 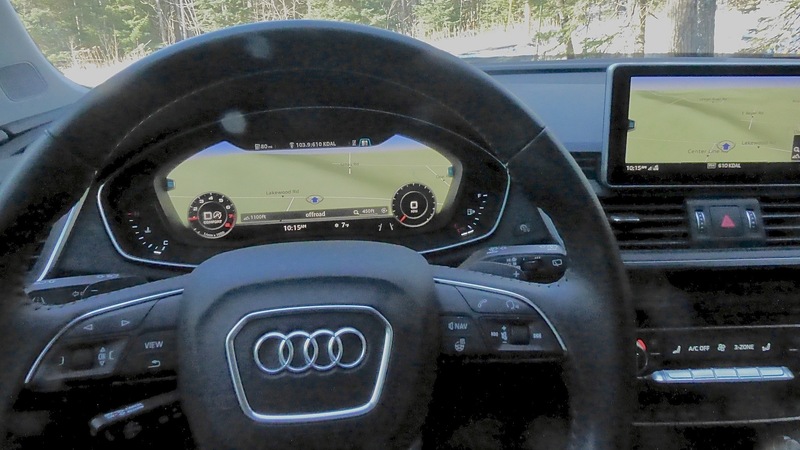 Most impressive alteration of instruments allows for full-width Google map image of where you are in both A5 and Q5. The Q5 had rock gray interior with high-gloss gray oak wood inlays, while the A5 Sportback had Atlas beige interior with high-gloss walnut wood inlays for trim. The Q5 has an electronic stabilization control with off-road mode, and even has hill-descent control for descending steep hills off-road. Or maybe in Duluth. The A5 Sportback lacks a couple of those SUV-ish things, but counters with a sport mode on its stabilization control, plus adaptive-damping control for the suspension. 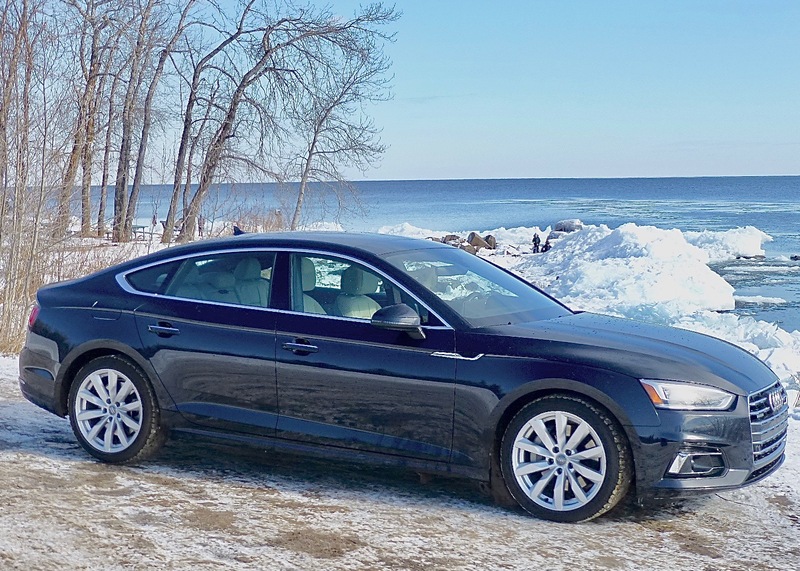 Both vehicles have good handling and comfort, and while the Q5 2.0T adds some off-road versatility and better hauling-stuff characteristics, the A5 Sportback 2.0T has the sportier handling and adaptive suspension to earn an edge on road. Both do the job in the harshest winter conditions, and the price is so surprisingly close…you just have to take your pick.